Just recently, I sent 6 of my songs to a Music Education website. The songs were accepted and are now available for download. You can also purchase the sheet music for the following songs. 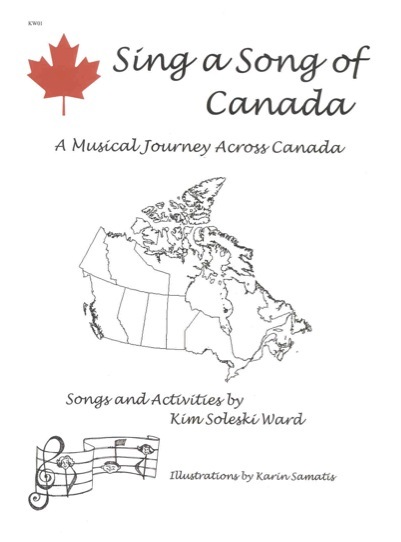 Sing a Song of Canada is a musical journey across Canada and also talks about Canadian history. First Among Equals is a song that lists the names all 22 of Canada’s prime ministers in melody. Ballad of Sir John A. is a musical biography of Canada’s first prime minister. Can Can Canada names all the provinces, territories and their capital cities to the tune of the Can Can. The Puffin Party tells the seasonal life cycle of Newfoundland’s provincial bird. In the last post, I described how I had almost given up on the dream of publishing my songbook, “Sing a Song of Canada.” That is where one of my friends comes in. Maggie is a very good friend, very supportive and encouraging. Right about the time I had decided to stop sending my book around, Maggie told me about a music publishing company that she knew of through a friend of a friend. This company seemed perfect for my book. They were an educational company that published music for learning. So, I decided to send my book to them. They were very encouraging but again, did not want to take the financial risk of publishing the book. But, this whole experience, with Maggie’s encouragement, energized me to send the book to a publisher that I knew in Ontario, Canada. After just a couple of weeks, an editor contacted me and said that they were going to edit the book and publish it!!! I was so excited. Just when I had almost given up, a publisher accepted the book. This, of course, is not the end of the story. You already know that in the end I have self-published the book. Here is a condensed version of the next chain of events. I received the news that they would be editing and publishing my book in September of 2006. The editor asked me to make changes. I did this and the corrected version was sent to her in April of 2007. Then, in June 2007, this company was bought by another music publishing company. I called the editor in June and she told me of this event and said that she would be “presenting” my book to the new owners. I called her in September. She still hadn’t “presented” my book. I waited because, I didn’t know what else to do, and finally called her again in April of 2008. She said that the new owner was very ill and she was not able to present the book. Remember, this is now almost 2 years after the first company agreed to publish the book. I then called the editor in July of 2008 and she said that the owner was still very ill and his son, who was running the company, was not able to look at the book. She gave me permission to send the book to other companies. Well, I was pretty annoyed. I had waited 2 years (that was dumb of me) for the editor to work on my book. In the fall of 2008, I called another company who had received my book several years before. The owner still had the book and was very interested. They were the ones that suggested I self-publish and they would set up a distributing contract with me. This means that I would take on the costs of printing, they would do the marketing and distributing. The best part of this arrangement is that I retain all rights to the work in its entirety. I have been working with Leslie Music Supply for over one year now. They are promoting the book to retailers. So far sales have been very slow. I have been trying to get the word out and tell people about the book. This blog is one of my outlets. I would recommend self-publishing to anyone who has something that they truly believe in. I know that “Sing a Song of Canada” is a useful tool for teachers. I use it and my students really enjoy the songs and activities. And, I know that of many other teachers who are using the books successfully. So, if you believe in your work, get it out there!!! The opening ceremonies are a perfect example of how music is extremely important at a sporting event. The music allows the home country to display their culture. The songs raise excitement and anticipation for the games. The Vancouver show contained many references to Canadian culture that are included in “Sing a Song of Canada”: the importance of the First Nations drum, Emily Carr paintings, a quote from Pauline Johnson, the diversity of the landscape and people of Canada, to name a few. Enjoy the rest of the Olympics and keep singing those Canadian songs!!! As I have stated in earlier posts, I am an elementary music teacher. Over the past 20 years of teaching, I have written many songs for children. I believe that music is an amazing teaching tool, and, most of my songs are related to non-musical curriculum areas. 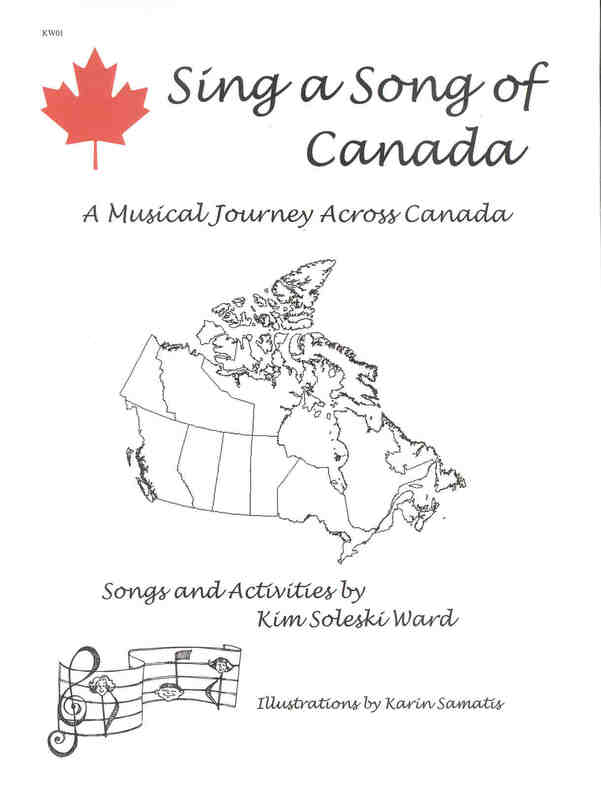 Sing a Song of Canada is one of my songbooks that is available for sale through Leslie Music Supply. 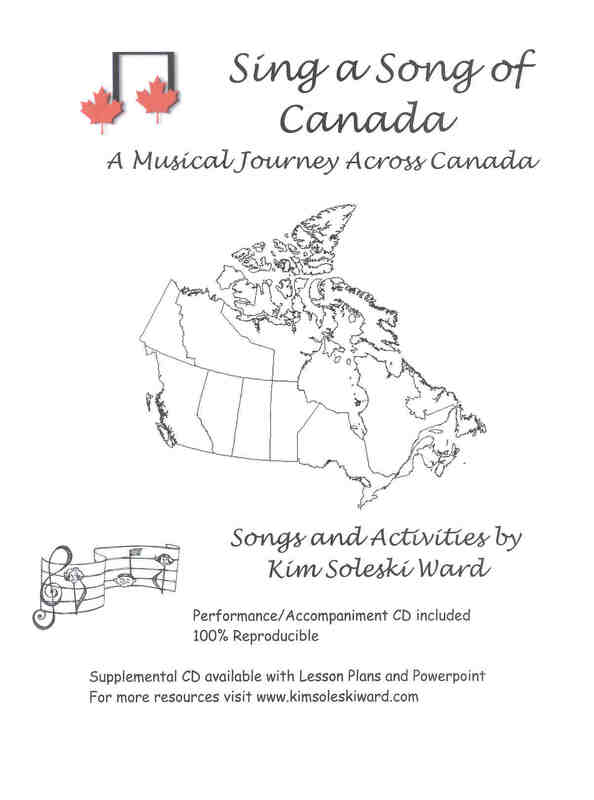 http://www.lesliemusicsupply.com In this songbook, there are 22 original compositions that teach about the history and geography of Canada. For example, “First Among Equals” teaches the names of all 22 Prime Ministers. “Can Can Canada” teaches the provinces and territories and their capital cities. There are songs about Canadian icons such as the moose, the ookpik, the beaver, butter tarts, and, the Aurora Borealis. Also included are 5 traditional Canadian folk songs and also the national anthem. I was born and raised in Canada and I love to share the wonders of Canada with my students. The songs are a fun way to introduce the country and also teach the students musical skills while they learn about Canada. An Ookpik is a little stuffed creature that was created as a way of promoting trade to Canada. A butter tart is a uniquely Canadian dessert. Kind of like a miniature pecan pie but not really. My song about the moose is called “My Dewlap.” The dewlap is the flap of skin that hangs down from the moose’s chin. 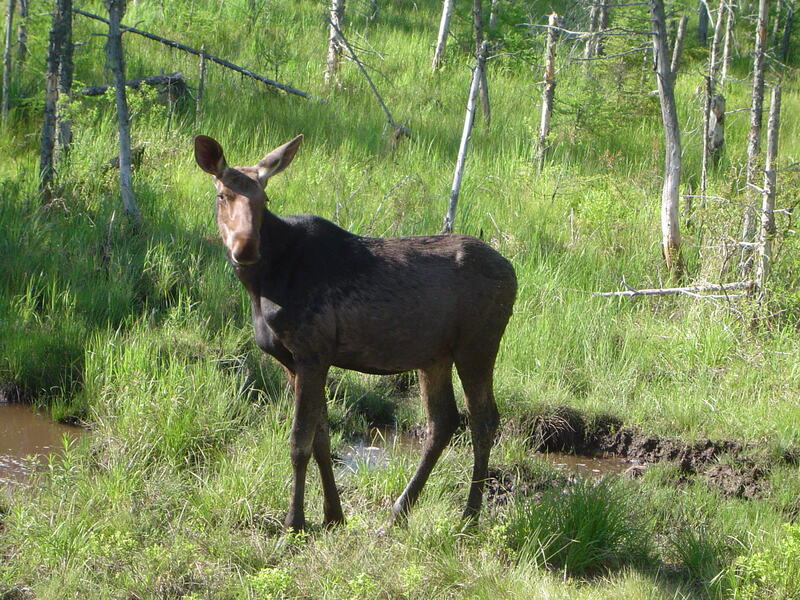 If you have never seen a moose in the wild, I highly recommend driving Highway 60 in Ontario through Algonquin Park. I have seen a moose along that highway absolutely everytime I have driven there. And, don’t just drive through, Algonquin Park has beautiful hiking trails with amazing scenery. I was born in Bracebridge, Ontario which is a little town very close to Algonquin Park. There is nothing better. Last night both of my elementary school choruses sang in their Winter Concert. One chorus meets weekly before school and is open to all students in Grade 4, 5, and 6. I have 31 dedicated musicians in this group. The second chorus is all the Grade 4 students in the school, 76 beautiful singers. The theme of the concert was “Songs That Changed the World.” This is a theme that I like to express to my students. Music really can change the world. They sang a simple arrangement of “For Unto Us a Child is Born” from Handel’s Messiah. When George Frederick Handel died in 1759, he donated an original score of the Messiah to a children’s orphanage in London. This foundation still exists and it has been using that music score for benefit concerts for over 250 years!! They sang “Follow the Drinking Gourd” a code song that was used by slaves to find their way along the Underground Railway. They sang “We are the World” which has raised over 63 million dollars for famine relief since its release in 1985. That’s a LOT of positive changes. Each chorus sang 6 songs that changed the world. The reason I say there is nothing better is because of the enthusiasm of the students. Their faces were shining as they showed up in their fancy dresses, suit coat and tie, dress pants etc. They were all focused through the entire 60 minute concert, including several students who have been identified with “special needs”. And the sound was just precious. Many of the students sing with every note on pitch. This is mixed with the students who are still working on expanding their vocal range. But, that is the beauty of the sound. They were all singing their hearts out, smiling as they performed. And, I have to say, they really changed my world last night. Thank you. I am an elementary school music teacher. I spend my day singing and dancing with very happy little people. What could be better than that? And, those little people are learning and growing while they are singing and dancing with me. I actually started out my working life as a music therapist. Although related, music therapy and music education are very different. Both jobs, of course, use music. But, in music therapy, the music is used as a tool to work on extra-musical goals. In music education, the teacher is teaching music skills. But, because I have had the experience of both careers, I understand the many hidden benefits of music. Here’s a simple example. When a child is playing a xylophone and making a simple steady beat to the music, there’s a LOT going on there. They are working on fine motor skills by holding onto the mallets and making them work in just the right way so the xylophone bars are ringing. Their attention span is increased as they focus on the sound of the music and sifting out a steady beat from all the other sounds that are present in the room. They are working on social skills because they have to listen to all the other xylophone players around them and get their beat in sync with everyone else. As they listen and follow the music, they are gaining self confidence because they can hear the beautiful sound they are making. All of this doesn’t even take into account the music skills themselves. Learning how to play or sing in an ensemble is a skill that everyone can use throughout their entire lives. So, I would suggest that if you haven’t sung or danced today, do it!! It will make you feel really good!! !